2) Insulated mat. 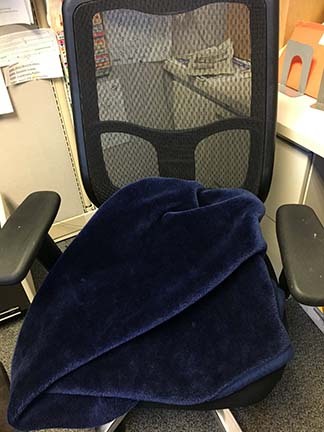 Rubber insulated mats are excellent for keeping your whole body warmer if you work on the bottom floor of a building constructed on a slab, since the cold permeates the room from the floor up. 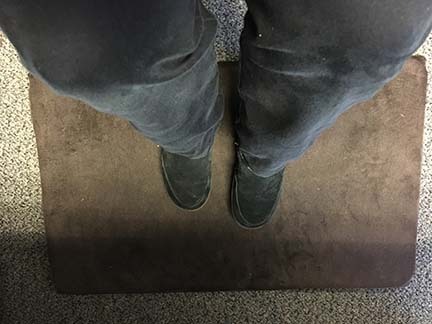 If you have a stand-up desk, be sure to stand on this mat to prevent the chill from the floor creeping up your body. If you sit and put your feet flat on the floor or rest them on an elevated riser, cover the floor or riser with the same insulated mat. This really seems to help! 3) Lap blanket. Yes, I know this conjures up images of little old ladies, but buy the thickest, fuzziest blanket you can find, throw it over your middle from knees to chest and tuck the edges under your body. It’s heavenly. 4) Fleece-lined tights. I’ve tried all kinds of long underwear over the years, but fleece-lined tights under pants are absolutely the warmest. Bonus: in the spring when you stop wearing them, people will think you lost 10 pounds! 5) Layers. Dress in separate layers for tops and bottoms. You can always take something off if you’re too warm. 6) Fleece-lined boots. Buy some knock-off Ugg boots or some similar footwear, layer a couple of pairs of super-thick socks underneath and warm up those cold blocks of ice at the bottom of your legs. 8) Hat and scarf. Several male coworkers swear that wearing a hat is the answer. A couple of them combine a hat with a wrap-around neck scarf, and they’re ready for the ski slope when the work day is done. 9) Fur-lined fuzzy slippers. When you won’t be moving around for a while, slip these on. 10) Thermometer. No, you can’t wear it — but it makes an excellent argument when you contact Facilities and ask them to turn up the heat and can prove the temperatures are hovering in the mid-60s. One day our Facilities guy came to my cube with an “air thermometer” that he waved around and showed me it read 70 degrees, and, in reply, I simply held up my manual thermometer that read 66 degrees and pointed to it without saying a word. He adjusted the heat in the room. 11) Telework. Do this as often as possible and turn up your home thermostat or layer some comfy clothing under sweatpants and sweatshirts. Somehow, when you’re at home you always feel warmer! 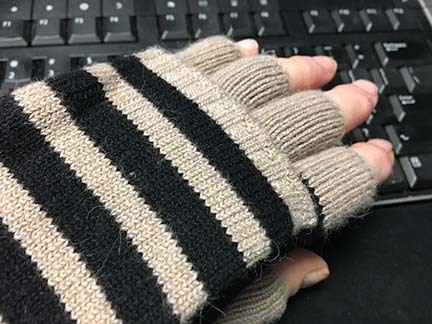 Have other tips how to make it through the work day when it’s so cold you have to go outside to warm up? Please share your ideas! 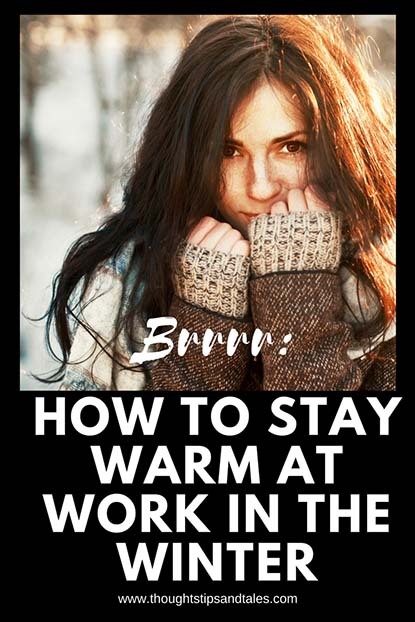 This entry was posted in life and tagged cold work environment, freezing at work, how to stay warm at work, tips to stay warm, warming up at work. Bookmark the permalink. Fingerless gloves are awesome. I wished they had those when I was working at a place that stayed cold winter and summer. You’re right – they’re really helpful! I laughed when I first saw them, but realize now how useful they are. I got a lot of mileage out of cashmere sweaters which kept me much warmer than merino wool sweaters. My room was always cold, too. Will have to try to find one and check it out – thanks! My former employer allowed space heaters, it was heavenly. Though several of us used them and we tripped the breaker a few times.. (oops!) Thanks for the ideas.. I freeze at work and will try some of these!